When I think of the holidays, I don’t think of the Black Friday sales or venturing out to face mobs of people looking for a deal, I prefer a more civilized getaway where I relax, recharge and pamper myself in luxury. That’s why this holiday season Dave and I chose to escape to the Ritz Carlton Toronto for a weekend retreat. Located in the heart of the performing arts district, The Ritz Carlton is just steps away from Broadway Shows, The Toronto Symphony, world class dining, and Toronto’s top attractions. The Ritz has its finger on the pulse of Toronto without the frenzy of staying in the middle of Dundas Square of the hectic financial district. Once you step into the grand lobby, you instantly feel at home as the friendly staff welcome you to their quiet oasis in the city. Checking into our suite overlooking the CN Tower and waterfront, we immediately felt the tension of the week melt away. Rooms are elegant at the Ritz without being pretentious. I don’t know about you, but the first thing I want to do is flop on the bed when I enter a room. The sheets, pillows and mattress are so comfortable, you never want to get up! But, we didn’t come to The Ritz Carlton to sleep. After you’ve checked into the Ritz, take your time to relax. Head down to the DEQ Terrace and Lounge to snuggle up at the cozy fireplace while enjoying Afternoon Tea. Walk in the shoes of the Dutchess of Bradford while enjoying an assortment of teas, pastries, and sandwiches of salmon on rye, cucumber rolls and apple and smoked chicken. With a light snack in your belly it’s time for a dip in the pool or a spa treatment at the number 1 ranked spa in the world as listed by Travel + Leisure 2013. We loved the Ritz Carlton so much, we didn’t want to leave and that is why we spent our day taking it all in. Why go somewhere outside the hotel to eat when it has one of the highest ranked restaurants in the city? We sat down for dinner at TOCA for a feast designed by Head Chef Jitin Gaba. Starting with the Caprese Salad to die for, we knew we were in for a treat. Caprese is my go to salad of choice, but I have never tasted one so divine. Chef Gaba chose to roast the tomatoes for four hours, making their fresh home made gazpacho as the base. Add a buffalo mozzarella that is flown in weekly topped with fresh lobster and you have yourself a masterpiece. We paired this with a TOCA Chardonnay and enjoyed a delectable beginning. The main course consisted of a TOCA Signature item. My Ravioli is the most popular dish on the menu selling 1600 plates per week. I could understand why. It was the best ravioli I’ve tasted. The handmade ravioli is stuffed with caciotta cheese and topped with a herbed tomato sauce. Pure heaven. Our meal ended in the cheese cave; A signature experience at the Ritz Carlton Toronto. Chef Jintin joined us in the temperature controlled room to talk through the cheese of the world that he has hand selected. I loved how passionate he was about food. And I was impressed that so many local Ontario and Canadian cheeses were on hand. He talked us through cheese made from descendants of the first cows in Canada that arrived in 1608. There are 500 cows with this bloodline that make some of the greatest cheeses. As he talked us through his favourites, we left it up to him as to what choices to have for our dessert. The cheese board came out with an array of brie from the Champagne Region, Oro Italiano with truffle and saffron and cheese made with goat’s milk. It was paired with Iniskillin Ice wine that offered the perfect accompaniment. 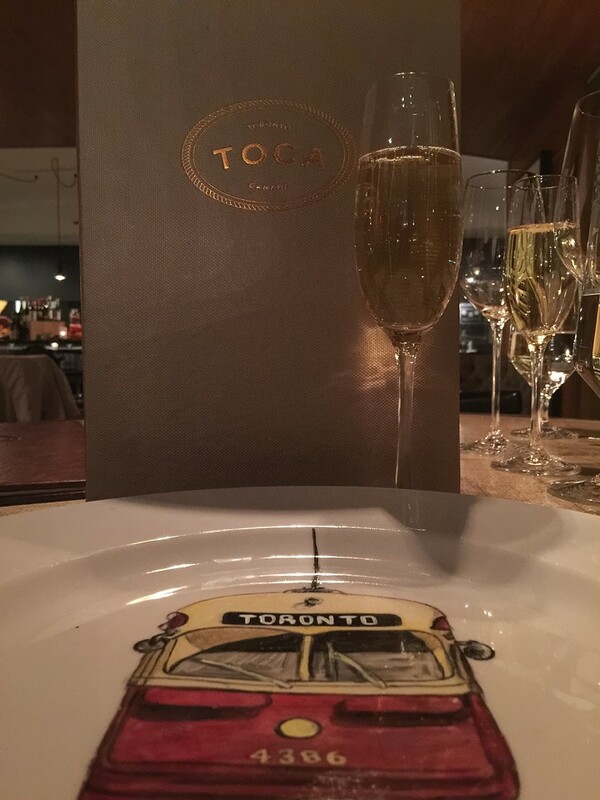 Our night out at TOCA was a night to remember. A night at TOCA is a night out alone. A proper tasting meal takes a good two to three hours, so we didn’t need to do much more for our night out in Toronto. For us, the day ended with meeting up with friends for drinks before drifting off into an endless slumber. We’re local, former Toronto residents, so we know there is a ton to do in the city and hopefully more of you are coming to town for more than one night. After you’ve spent your first day enjoying the luxuries of the Ritz Carlton, it’s time to venture out to what’s up. You’re lucky. The location of the Ritz is just a short and cheap Uber ride to anywhere. Across the street from the Ritz Carlton is Roy Thomspon Hall, Toronto’s premier classical music venue. Enjoy a matine of the Toronto Symphony Orchestra playing the Lord of the Rings in Concert or the 12 Days of Christmas. If you want live theatre, the Royal Alexandra and Princess of Wales theatres are located across from Roy Thompson Hall where you can take in a show like Matilda the Musical, The Illusionists Live from Broadway, or Potted Potter. I haven’t seen Potted Potter yet, but I really want to see all seven books performed in 72 short and hilarious minutes! If it’s your first time to Toronto, you must go to the CN Tower. Located just steps from The Ritz, The CN Tower is our favourite Toronto Landmark. At one time, it was the world’s highest tower. It has fallen in the ranks but it is still very impressive and offers incredible panoramic views of the city. If the weather is good, you may want to try the EdgeWalk. The world’s highest external walk on a building. Want to learn get a bit of history into the Canadian psyche? Head over to the Hockey Hall of Fame on Front Street to see what all the fuss is about. Canadians go gaga for hockey and this museum will give you insight into why we are so obsessed with the sport. There are interactive activities and of course the Stanley Cup is on display. Speaking of sports, if you love hitting up awesome sports venues, the Ritz is located close to the Rogers Centre which is home to the Blue Jays and Toronto Argonauts and the Air Canada Centre that is home to The Toronto Maple Leafs. If you want to see Toronto sports fans in action, head down to one of these venues for an afternoon or night out. And finally, if you are a fan of movies, you must visit the TIFF Bell Lightbox Theatre. Home to the Toronto International Film Festival, the Lightbox Theatre has movies and events year round celebrating films from around the world. And to celebrate the small screen, visit the CBC, Canada’s National Broadcasting network where you can tour the history of Canadian television dating back to 1936. When I was a make up artist in the Toronto film industry, I spent many a day in this building and it is an impressive design. Toronto is a huge city and there are many places to visit from Yorkville to the Distillery District, but with a stay at the Ritz Carlton Toronto, you have the most vibrant community right at your doorstep. Sure you could run around to see the rest of the massive metropolis, but I suggest staying in the Entertainment District for top notch cultural experiences, fine dining, exciting entertainment and excellent attractions. Ask the Ritz Carlton Toronto Concierge for more food and entertainment recommendations. That’s what they’re there for and they’ll be able to share some of the hidden secrets too. Our night in Toronto was courtesy of the Ritz Carlton. All opinions are our own. We weren’t obligated to write about our experience at the Ritz or to even share our thoughts on what to do in Toronto. This is something we wanted to share with our readers to help you experience the best of Toronto.